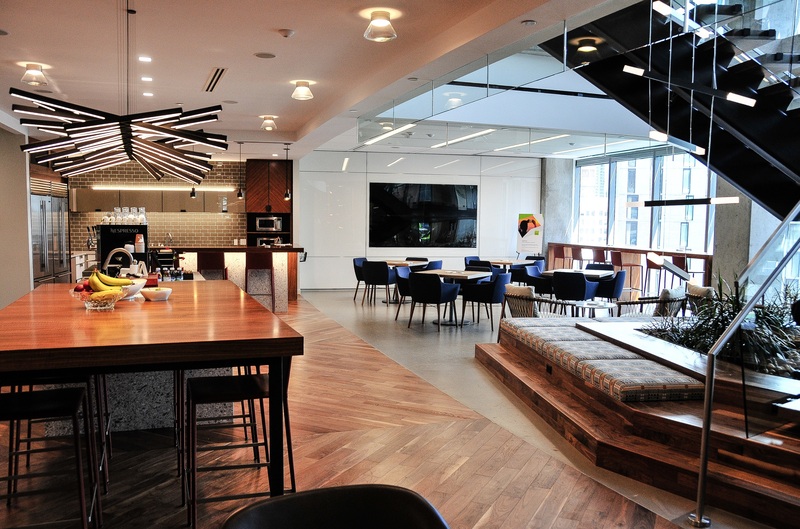 If you are in the commercial office market right now, you know that one of the hottest trends in office design is “resimercial”: residential-minded furniture and finishes designed to facilitate creative work. The philosophy behind resimercial is that comfortable environments are more conducive to creative and collaborative work. While examples of the resimercial aesthetic abound in the tech and media worlds, it is now making its way to more conservative professions such as law, and the result is stunning. 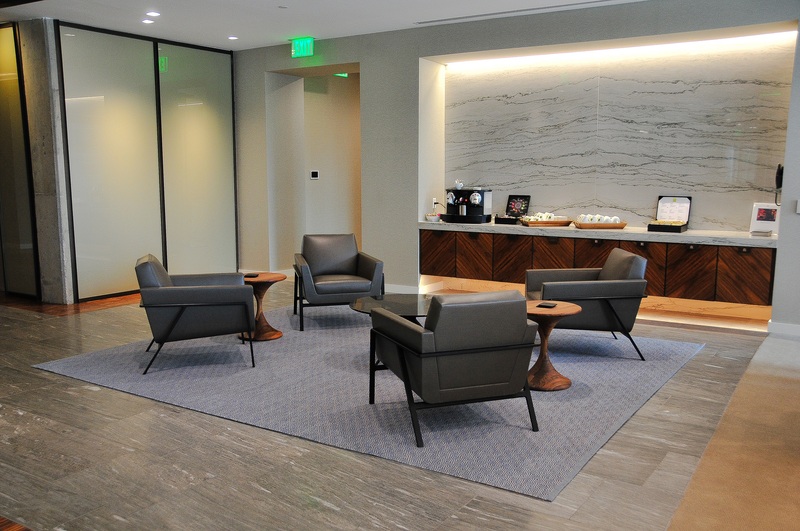 Hogan Lovells recently relocated to truly remarkable space designed by RNL Design in the new 1601 Wewatta building in Denver’s trendy LoDo area. The entire office feels like a chic mid-century modern living room that would belong to the hippest person you know. If Hogan Lovells is looking to recruit attorneys with great taste, their design is on point. And I would wager that the fact that attorney offices are smaller in this new location has been rendered a moot point by the design, furniture, and amenities that abound there. 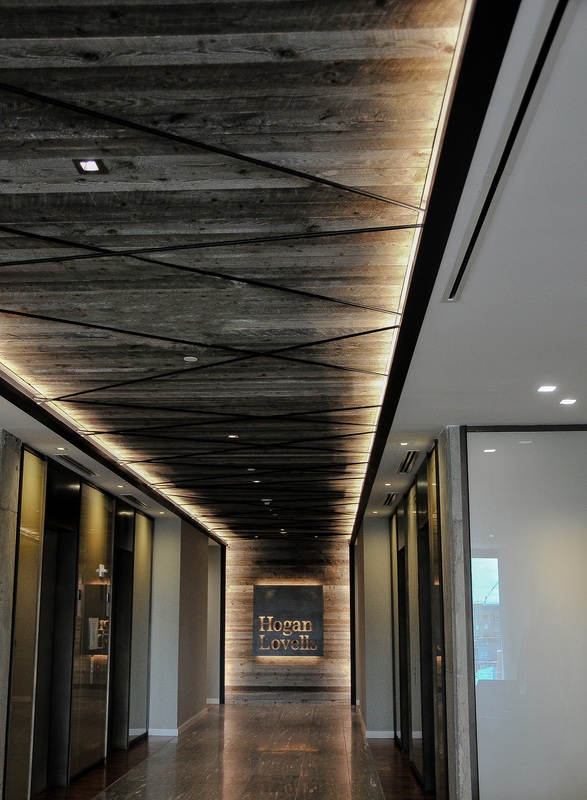 The experience of Hogan Lovell’s new offices begins the moment you step off the elevator into an elevator lobby that features reclaimed wood ceilings and exquisitely tiled floors. From there, you walk into a reception area and lounge complete with a Nespresso machine and selection of imported teas. The floors here and throughout the space are a beautiful combination of imported tile, hardwood, polished concrete and carpet. The focal point of the reception area is a striking interior staircase requested by Hogan Lovells to encourage interaction between the occupants of the firm’s three floors. The RNL team suggested making it visible from the lobby and placing it on the glass to maximize the views and access, thereby encouraging its frequent use. This staircase was built with hardwood treads and open risers, and the sides of the stairs are enclosed with seamless glass panels. A rock and plant garden sits at the base of the staircase and, if you look closely, you realize the rocks are actually made of felt. 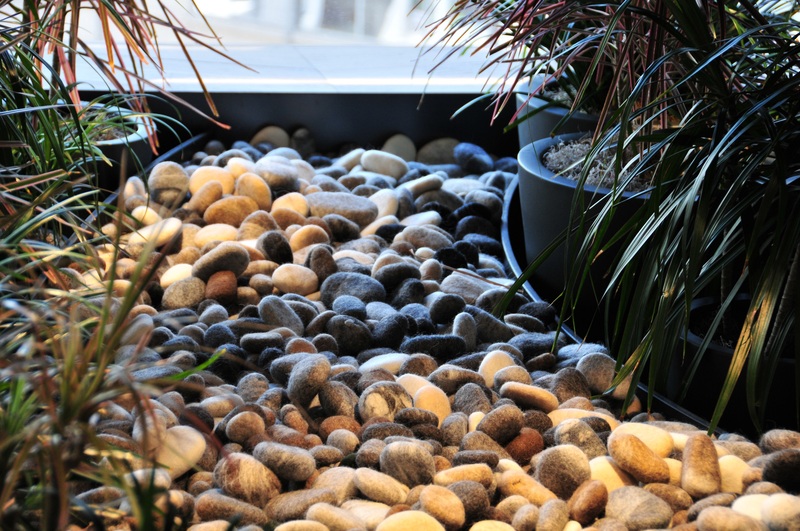 When the natural rocks initially planned for the base proved to be an acoustical issue, RNL sourced a felt rock maker on Etsy and the result is stunning. Next to the base of this staircase is a large lounge area referred to as The Junction, with another Nespresso machine and a high end but very comfortable, residential-feeling kitchen fully stocked with healthy snacks, beverages, beer, and wine. 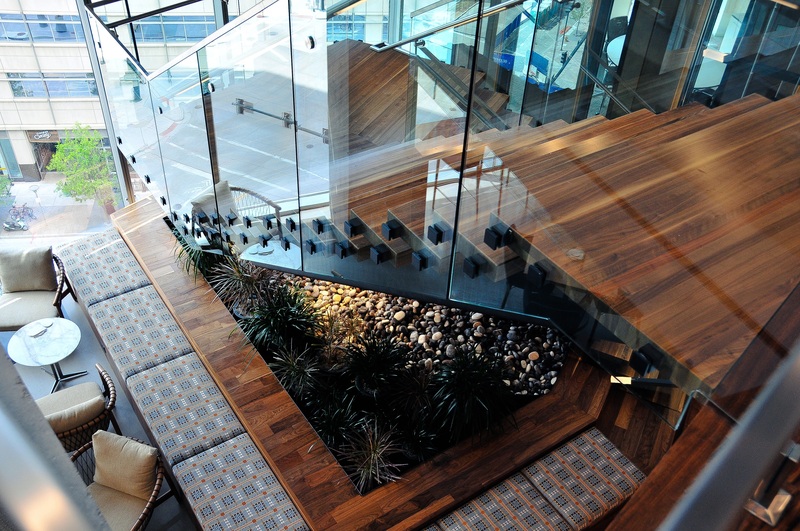 It is furnished with soft, inviting seating and, like the stairs, it is on the glass. There is a large conference area off the main reception that has a number of varying size rooms which can be further divided with collapsible internal walls or combined to form one large area with glass walls that slide away. 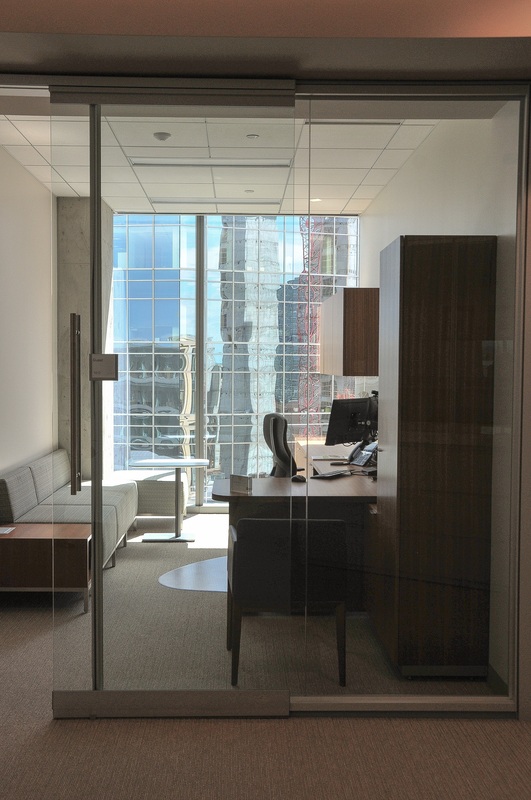 The lawyers’ offices are all one standard size of approximately 160 square feet. Although these offices are long and narrow, the firm and its architects selected furniture that optimizes the shape, incorporating long sofas and small work tables as well as stand up desks and built in shelving. As we walked through the offices, I noticed that each lawyer was allowed to choose their own furniture color pattern from a four-color palette. They further personalized their offices with artwork, pillows and personal memorabilia. It made for a very stylized yet professional atmosphere. The support and administrative staff works from low-rise wood-paneled workstations. Reflective of the fact that no detail was overlooked by the design team, in between workstation areas, legal file drawers were placed under marble waterfall-style counters. 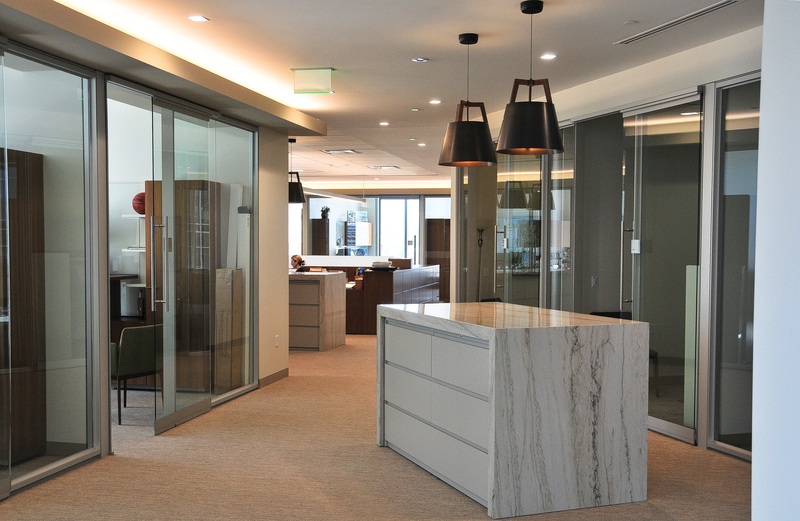 Hogan Lovells – my new favorite law office space – is a perfect example of resimercial design principles done right. 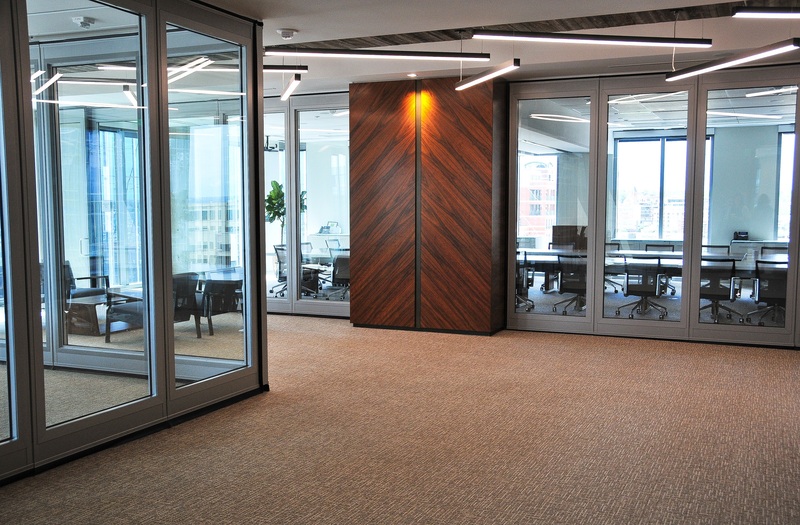 To read more on law firm build outs that incorporate resimercial design, click on this post about Littler Mendelson’s San Francisco offices.